Traceroute is a network diagnostic tool used to check the network between two locations. For example, to determine the cause of slowness or timeouts a traceroute must run from the starting point of a network connection to your DreamHost server. 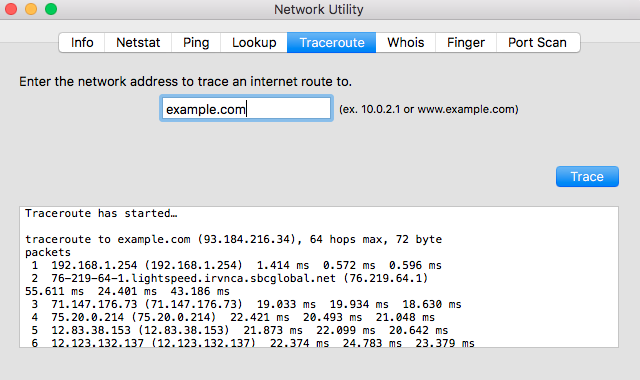 When should I use Traceroute? Below are some examples of when a traceroute might be needed to troubleshoot an issue that you are experiencing. If you notice your site running slow, run a traceroute from your computer to your website to see if there are networking issues between your location and the DreamHost server. If you are experiencing issues related to your mail connection, run a traceroute to determine the quality of of the connection to the mail server. View the 'Email client configuration' page to find your mail server name. It is either imap.dreamhost.com or pop.dreamhost.com depending on your connection preference. The above example shows the network hops to the server and lists no timeouts on the network connection. If timeouts are listed, there may be a network related issue occurring. Click the “Enter” key to run the tool. For most Linux distributions, you’ll need to first install the traceroute package. View the SSH for Mac OS X article for instructions on how to open your terminal. Click the Traceroute button in the top bar. If you’d like to share your results with a support representative, you’ll need to paste them into your ticket. In the Windows command prompt, right click and choose ‘Mark’. You can then paste into any text editor or your support ticket. Another option is to have traceroute results written directly to a text file. This creates a file named tracert.txt within your C:\ folder. You can select any folder in which you wish to save the file. You can run the following command to write the results of traceroute to a file, and you can specify any location you wish.